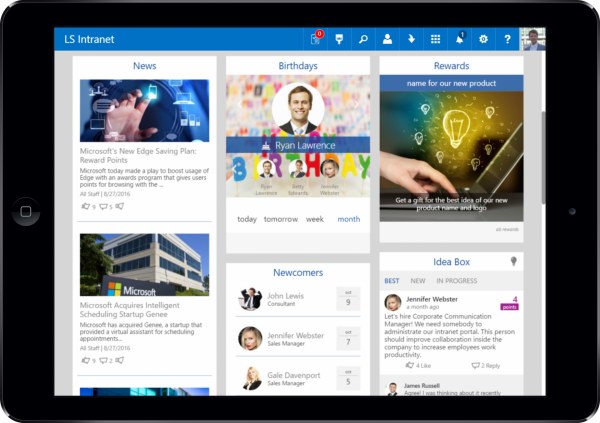 LS Intranet is a digital workplace, where employees can easily communicate and collaborate with each other. It’s your own corporate intranet that facilitates multiple employees collaborating on projects, and working in synergy. It’s a great opportunity to pull your people together and develop those cohesive relationships. Take more from your Office 365 with SharePoint intranet solution by Lizard Soft and double your team productivity! LS intranet allows you to significantly reduce time spent on Admin Work, you can have applications approved in 5 minutes, instead of 5 days. Request for things like business trips, booking meeting rooms, vacation times, rmaintenance etc. When an organization has the ability to house all of their administrative and project management tasks and duties in one convenient place, the overall efficiency, and productivity of the entire organization will experience significant growth. When employees are encouraged and invited to contribute to problem-solving and improving business processes, they will become your company’s biggest asset. The tool for this, that comes with the LS Intranet portal, is called the Idea Box tool. It’s your own corporate intranet that facilitates multiple employees collaborating on projects, and working in synergy. It’s a great opportunity to pull your people together and develop those cohesive relationships.